Natural gas naturally leaking from ground in Taiwan, in the absence of all corporate and government supervision. Source. Shouldn’t a peer-reviewed paper which purports to tie chemicals produced in the manufacture of natural gas (fracking etc.) to birth defects actually measure exposure (of fetus carriers, i.e. “mothers”) to those chemicals? If you answered yes, you’ll never make it as an academic or government bureaucrat. Those folks know that successful careers are those which produce the most work for government. As proof of this, take the peer-reviewed paper “Birth Outcomes and Maternal Residential Proximity to Natural Gas Development in Rural Colorado” in Environmental Health Perspectives by Lisa M. McKenzie and a slew of others, each of whom relies for their living on government. Back to McKenzie. Here’s how Think Progress summarized her findings: Preliminary Studies Show Potential Health Risk For Babies Born Near Fracking Sites. Preliminary, potential, risk. Who said science is political? McKenzie was interested in the causes of congenital heart defects, neural tube defects, oral clefts, preterm birth, and term low birth weight. Besides naturally occurring genetic defects and defects caused by maternal folate deficiency, smoking drunkness and drug use, and other such things, it is suspected that exposure to benzene, toluene, polycyclic aromatic hydrocarbons, and petroleum based solvents might also cause congenital birth defects. Here’s the winning phrase from the paper: “Many of these air pollutants are emitted during development and production of natural gas (referred to herein as NGD) and concerns have been raised that they may increase risk of adverse birth outcomes and other health effects” (and she cites herself as a source for this assertion). Many of these pollutants are emitted? Okay, I’ll bite. Which? Which exact pollutants were the women in her study exposed to, and at what concentrations? Answer: McKenzie doesn’t know. Nobody does. The epidemiologist fallacy has struck again. The best she could do was to measure how far from a well location each mother lived at the time of birth. Where were those mothers before birth? Same addresses? Did they spend most of their pregnancy near the wells or away on vacation? What genetic characteristics did the people who lived near gas wells have that people who lived near the country club do not? How many women were drunks or druggies? Answer: McKenzie doesn’t know. Nobody does. McKenzie arbitrarily (to us readers, anyway) picked a 10-miles radius to label mothers “exposed”—to what, always remember, we don’t know. But doesn’t saying “exposed” sound scary? And being “exposed” to a mere gas well can’t hurt you unless you stub your toe on one. And then came the wee p-values. But not before manipulating the data in order to get it to work. Inexplicably, McKenzie divided living-near-gas-wells (what she called “exposure”) into terciles. Unfortunately for headline hunters—I’m still amazed Think Progress missed this—wee p-values were found for decreased risk of low birth weight and preterm birth. Why did we not see in large print “Exposure To Fracking Reduces Low-Birth-Weight Babies”? Or maybe the mothers who live away from the country club are younger and eat more heartily? Nah. Another oopsie: oral clefts also appear to decline in frequency for some “exposed” women. So says a wee p-value. And no go for neural tube defects or congenital heart defects for the majority of “exposed” women. No go in the sense of no wee p-values for the “exposed”. Only those in the highest arbitrary tercile evinced wee p-values (and small effects) for congenital and tube defects. Yet we have to ask which method McKenzie used to correct for the multiple statistical testing she did, i.e. all the hunting for signals. Well, you know the answer. You’re forgetting that McKenzie never measured exposure to anything, but only distance from listed home residence to gas wells, and that some of her analysis showed benefits from this “exposure.” And since this isn’t real exposure, we have to adjust the analysis to account for the uncertainty of substituting addresses for exposure to unknown chemicals. Once that is done, the wee p-values would almost certainly swell past publishable size. There is nothing but surmise, conjecture, wishful thinking in papers like this. Believing that fracking is bad for babies based on this paper is like convicting an accused murderer simply because he lived near the victim. Maybe you’ve talked about it elsewhere, but the practice of discretizing continuous variables seems really suspect to me. The underlying assumption appears to be that exposure to bad chemicals is a function of the distance to a source of chemicals. We can reasonably form one of two hypotheses. Either chemicals in the air drop off as a function of radius, or they are well mixed. Or, if chemicals get into the water supply, distance from the source of the chemicals shouldn’t matter if everyone gets the water source piped to them. That leaves us with either a continuous relationship to exposure, or with a binary relationship of exposed and not exposed (with some variation in the ‘exposed’ group). The authors have taken something that is either continuous or binary and split it into three groups. How this practice is deemed acceptable (even while ignoring the epidemiologist fallacy) is beyond me. A MSM headline writer would have titled this post “Exposure to Fracking Inflates Babies’ Birth Weight” to make it appropriately scarier. Scary Headlines don’t want to be too specific. Maybe “Exposure to Fracking Dangerously Changes Babiesâ€™ Birth Weight”. Now it’s scary no matter which direction the weight goes. Measuring the actual exposure is irrelevant and might cause confusion. 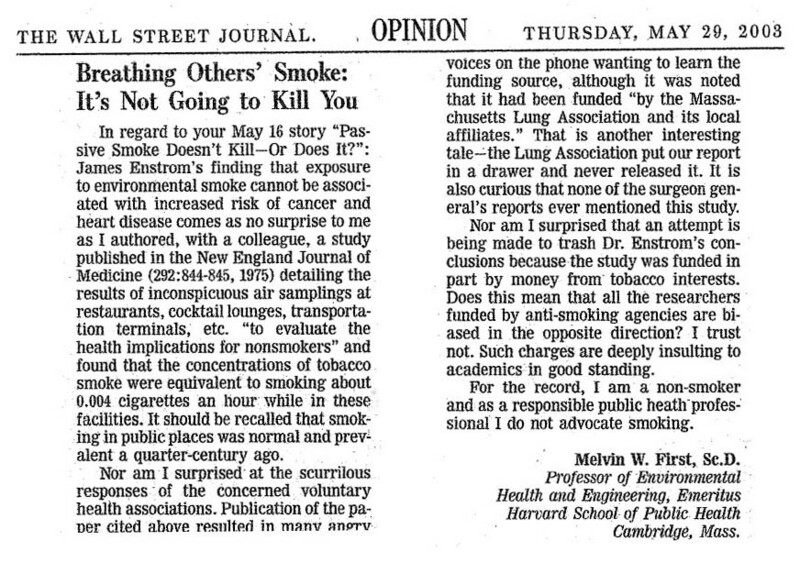 Just remember the EPA determined that exposure to second hand smoke causes over 3000 cases of lung cancer a year, but they didn’t measure any exposure. People were asked about their exposure, i.e. they were given a questionnaire. You can determine causality by taking a poll. Here is what actual measurement of exposure found. 1- Are you seriously trying to argue that fracking is good for mothers\babies health. 2- The companies are protected by law to not disclosed the chemical they use in fracking. 3- the companies cannot be liable under the clean water act. 4- Why is it that people that support fracking rarely support it when it is done near their own house. I am not arguing. The authors are. It’s what their wee p-values showed them. Are you questing peer-reviewed science, you denier? Apparantly not so secret. About half the companies do disclose. North Carolina was attempting to outlaw disclosure though I don’t know why. I support fracking and live very near it. As far as I’m concerned, they can frack in my back yard if there’s enough room. So it seems that some people do support fracking and live near it. I’m betting a lot of my neighbors would feel the same way. Oh, and Sylvain, Wyoming passed mandatory disclosure of fracking chemicals in 2010, as did Texas and Michigan. This is not new. Off-topic, but there’s a new paper that cries out for your gentle ministrations: according to the headlines (which, of course, occasionally can be misleading), they have been able to prove that the warming over the last 25 years (hmmm…what warming, one might ask), is human-caused to a certainty of “99.999%”. “A probabilistic analysis of human influence on recent record global mean temperature changes” in Climate Risk Management. See: the Hockey Schtick for his summary. I’ve often wondered why when they extract a chemical that can kill you if ingested down a few thousand feet and replace it with fracking liquid, why that’s a big deal. If the oil wasn’t harming you down there, why will the fracking liquid? I would argue that fracking is good for mother’s and children. Anything that keeps energy prices low allows for more of mom and dad’s money to be spent on healthier food and better healthcare. These things that have a much more direct affect on parents and baby. Paul W: Very good point. The oil/gas is more toxic than the fracking chemicals. It a wonder that anyone would live in Pierre South Dakota, there is an artisan well that spew out natural gas about one hundred feet from the Capital building, the gas use to burn as the water came out. The water is also warm, for years they used the gas to heat the Capital, from the small of the water I also would assume there are sulfides in it. The water flows into the Capital pond. As evil as gas and it unknown chemical that might be in the water could be a hazard. Yet the biggest hazard in by the fountain and pond are the goose droppings on the grass and walkways since the geese love the pond since that warm water keeps it mostly open year around. If I was a young man without much ambition maybe I could get a grant to study the danger of having such a know hazard and doing nothing about it. After I determine such a well need to be capped, I sure I could find a relative’s firm that could bid and get the contract. Briggs: Yes, I guess I’m a denier. Texas and Nebraska gave imminent domain to corporation to seize land for their pipeline. Trade secrets can be any chemical they want to include. Mixing any two chemicals together can be considered trade secret. Over 190 chemicals are considered trade secret. Tell me in a couple of year when the well near you burst out and contaminate your drinking water. In Gasland 2 they interviewed over time a mayor who welcomed the fracking industry until he had to leave everything behind because is house was unsafe. The US only cares about corporations. Why should the one percent care about what happens in poor peoples back yards. Fracking should be done far from people or at least people that are affected by it should be compensated. Sylvain: As usual, you are not interested in truth. Since you have absolutely NO familiarity with the situation, reject actual government legistlation and accept garbage from NPR and EarthJustice) do live where fracking is done, have not worked in the field and most distressing, actually think “Gasland” and “Gasland 2” had any iota of truth, there is nothing more to say. You can’t fix a determined person who believes in fairy tales. Have a nice fantasy life. I’m sure that if Gasland is lie that you should be able to provide example of their lie? Other than that you only use the genetic fallacy argument. No point in providing examples or anything else to someone lives in a fantasy world and reject reality. You won’t listen, so I won’t speak. Since you believe in spite of the evidence, you are a Believer, and believe (I’m guessing) because you desire. Thus is environmentalism a (failed, flawed, fictitious) religion. Sylvain: You said people living next to fracking should be compensated. We are: we have above average wages, very low unemployment (help wanted signs everywhere), robust economy and no personal or corporate income taxes. All allowing people to achieve high standards of living and avoid becoming victims of the enslaving welfare system.